The holidays can be a hectic time. And sometimes it’s hard finding that perfect gift for everyone on your list. If you’re not sure what to get or want them to choose their favorite gift, then consider going with a gift card. It’s a gift they’re guaranteed to LOVE! We make gift cards easy. They’re fast and convenient at NBwebexpress.com. Select between gift cards that are sent by U.S. Mail or sent by email. Best of all…they never expire and can be used to pick from over 1200 styles of New Balance shoes, apparel and accessories. Gift cards are sent by First Class U. S. Postal Mail and take about 3-5 business days for delivery. A card balance may be viewed with a valid gift card number, check gift card balance. And cards can even be conveniently reloaded to add more at a later time, reload gift card balance. If you need to send one right away, E-Gifts may be the better way to go. They are sent by email immediately after your order is processed. And you can add a personalized message with your email. Want to learn more? 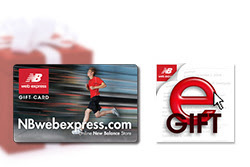 Check out our gifts cards right here on NBwebexpress.com. Make their season bright this year and spread the LOVE with a gift card. Happy Holidays!